Times Square was filled with people. Thousands of them cheering and screaming and waiting for the ball to drop. There were party hats and noisemakers. Streamers and confetti. Entertainers and TV cameras. Each and every one couldn’t wait til that magic moment. You could almost feel the anticipation as we watched the activity on TV in the comfort of our home, like millions of others across the country and the world. Like us, they were waiting. Across the globe other time zones had already passed into the new year, and the cameras would occasionally switch to show the other celebrations that were already over….almost as quickly as they began. In the scope of mere seconds, another year had ended, and another had begun. We were all excited, as we celebrated a new beginning, watched fireworks and tossed confetti, called and texted friends and wished them “Happy New Year!”, and then….what next? 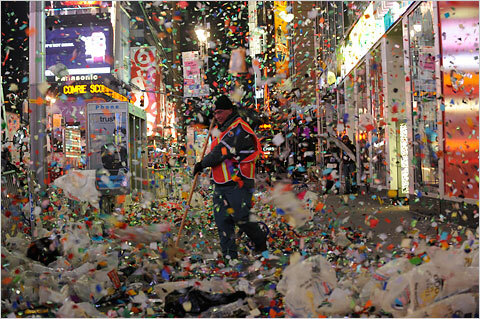 Within a half hour Times Square was almost empty, except for those whose job it was to clean up after the party was over. The celebrants had left, moving on to other parties to find another reason to celebrate, or going back to hotel rooms or homes, as the feeling of euphoria and excitement they’d just experienced slowly left them, and the same old feelings they’d tried to leave behind returned. The confetti and streamers that had been tossed in the air a short time ago, were already being swept away and discarded…forgotten. They were no longer needed or wanted. Because there was no more anticipation or excitement; nothing to look forward to. Really? Are you sure about that? Life often hits us like that. We spend so much time preparing for and anticipating an important event…and when it’s over, we’re let down. Almost depressed. We dissect what took place, look at the pictures, share memories with friends, but we can’t quite seem to capture that exact feeling again. We keep looking for that same excitement to reoccur, and we’re disappointed when it seems to be back to business as usual. Or is it back to business as usual because we allow it to be? We forget how to look ahead with expectancy and excitement, unless it’s for some big special event coming up. We forget there are little things to be excited about, as well as the excitement and anticipation of things to come that we don’t even know about. There are things we’ve been hoping for, and praying for, but we’re almost to the point of giving up on them. Because we’ve been waiting so long, and we just don’t think it’s going to ever happen. But guess what! It is! Isaiah 43:19 tells us, “Look at the new thing I am going to do. It is already happening. Don’t you see it?” (NCV) We only need to look with our spiritual eyes and heart. We need to see it as already accomplished and begin thanking the Lord that it’s already done. Because He has promised us, and we know that those promises are always fulfilled! I’m guilty of feeling that way, too. More often than I’d like to be. But this year I’m making a serious effort to change that! I am determined not to go back to that old way of thinking, and I’m going to start seeing all of those things as already done. There’s so much to look forward to in this coming year. The birth of our first granddaughter in May is the only one I really know about, but I know there are many more exciting blessings coming our way! I just don’t know when they will occur, or exactly what they will be, but I know they are coming. So I’m getting out the confetti and the streamers (and maybe a few balloons), and I’m getting ready! How about your joining me in the celebration? Hey, great post and reminder! 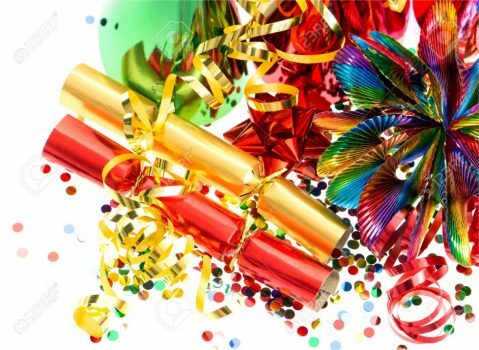 All the best to you in 2016!